In 1977, a self-described "international publishing venture" was launched. Selected and edited by authors Isaac Asimov and Ben Bova (ostensibly; as Todd Mason notes in the comments, the real editor was D. R. Bensen) and published in the first instance by the Dial Press in the US, the Quantum Science Fiction programme proclaimed on the cover of its first book that it would be "presenting the best in modern science fiction". Over a five-year period nine books would be published under the Quantum umbrella – two per year, then one in the final year of the programme – penned by some of the brightest new talents in SF (plus a couple of older hands, including one of the editors). It was a Quantum project for the quantum age... and yet these days it barely merits a footnote in the history of SF. 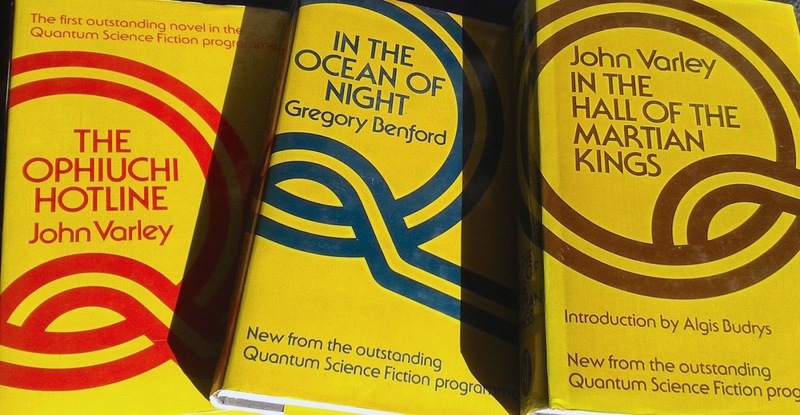 I learned of the Quantum Science Fiction programme recently having become interested in the work of SF authors John Varley and Gregory Benford, who both had early novels issued under Quantum's imprimatur. Though the programme seems to have been a Dial Press (where Asimov was an editorial board member) initiative – aside from an isfdb list of series titles (which neglects to include Orson Scott Card's Songmaster) there's next to no information about it online – most of the books included (bar Card's two entries) were also published by Sidgwick & Jackson in the UK, and it's in those editions that I bought Varley's debut novel, The Ophiuchi Hotline, and Benford's fourth, In the Ocean of Night. 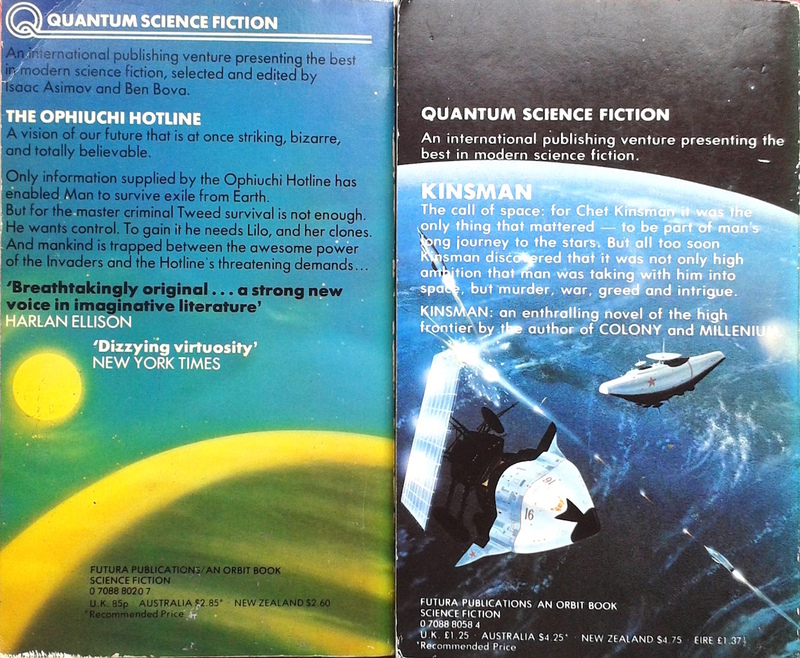 With the books in my hands it was hard to miss the Quantum connection: where in the US they were issued with illustrated wrappers utilising a border design that deployed the Quantum identification discreetly, in the UK Sidgwick & Jackson used the Quantum 'Q' logo as the key element in their near-uniform typographic gold dust jacket designs. I've no idea how well received the programme was at the time – the scant information available online suggests it's at least not terribly well remembered – but it certainly started strongly. 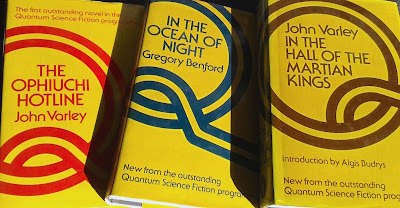 Varley and Benford were I guess back then the (relatively speaking) 'hip young gunslingers' of science fiction, The Ophiuchi Hotline and In the Ocean of Night the opening shots in their respective Eight Worlds and Galactic Centre sagas: distinctive, exciting SF offering fresh perspectives on space opera. 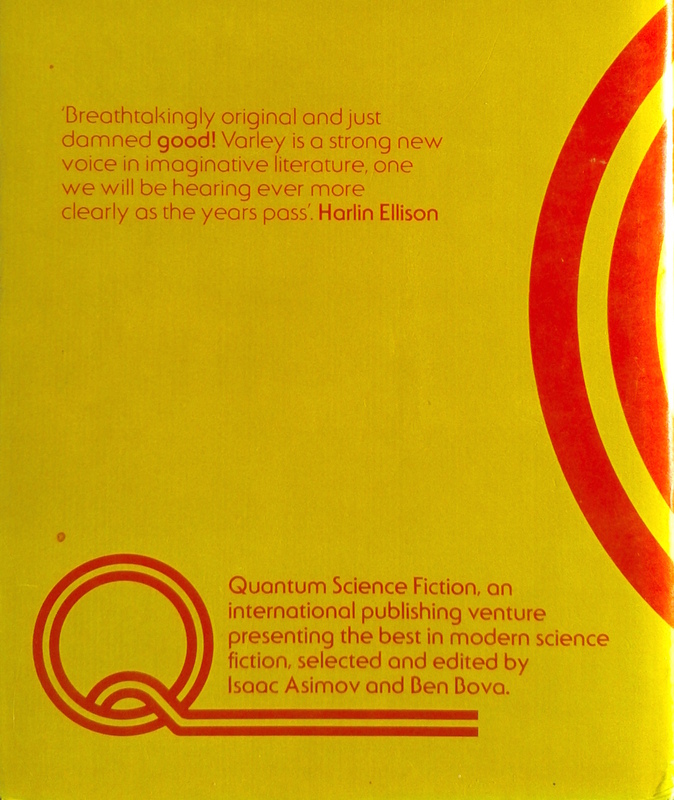 Thereafter, while the fourth Quantum offering, Varley's first short story collection, The Persistence of Vision – UK title In the Hall of the Martian Kings – was and is highly regarded, the third one, veteran Gordon R. Dickson's The Far Call, was and is perhaps less so – witness this withering contemporaneous Kirkus review and this scathing 2015 one (although this review from 2000 is kinder) – while the inclusion of fellow veteran Ben Bova's own Kinsman smacks slightly of favouritism. Despite all this, by 1981 the Dial Press had dropped any mention of Quantum from the jacket (front or back) of the final book in the programme, Orson Scott Card's Unaccompanied Sonata and Other Stories (although it still carried the Quantum logo and the legend "A Quantum Book" on its title page). And that was pretty much it for Quantum Science Fiction – and pretty much as much as I've been able to find out about it. Still, at least in the unlikely event that anyone else goes looking for information about the programme – and I'm still wondering what on earth possessed me not only to do so myself, but to then write a fairly lengthy blog post about it – there's a bit more readily available now. And if anyone can shed any more light on Quantum, please do leave a comment. Linked in Friday's Forgotten Books, 29/9/17. 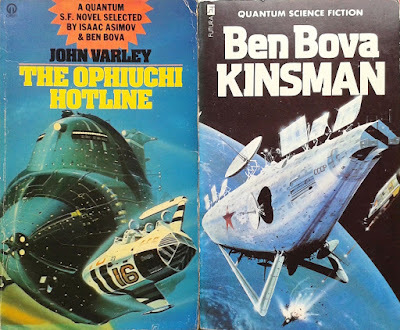 The Real editor of the Quantum line was D. R. Bensen; I've written a bit about this recently and you can check him out in the SF ENCYCLOPEDIA and elsewhere. James Wade's collapse as a publisher, I think, was the killing blow, more than mediocre sales, even given the partnership with the Dial Press, a division of Dell, which probably could've continued the program on its own, but I believe they might've had other fish to fry at the time...though I think it was another decade before they were acquired and merged into Bantam Doubleday Dell. And a snotty KIRKUS REVIEW note is par for the course. Fair point about Kirkus, Todd – and thanks for the additional info about D. R. Bensen and Dial Press! I had many of these titles, but I don't believe they were in the Quantum editions you show, but rather in other, probably later paperbacks. You probably had mostly the Dell paperbacks, Rick, rather than the Futura paperbacks from the UK Nick displays along with the S&J hardcovers. The earliest Dell pbs had Quantum tags on them as well, albeit also less blatant than the S&G branding.